Tim’s owl and my owl are now dug in in their boxes. 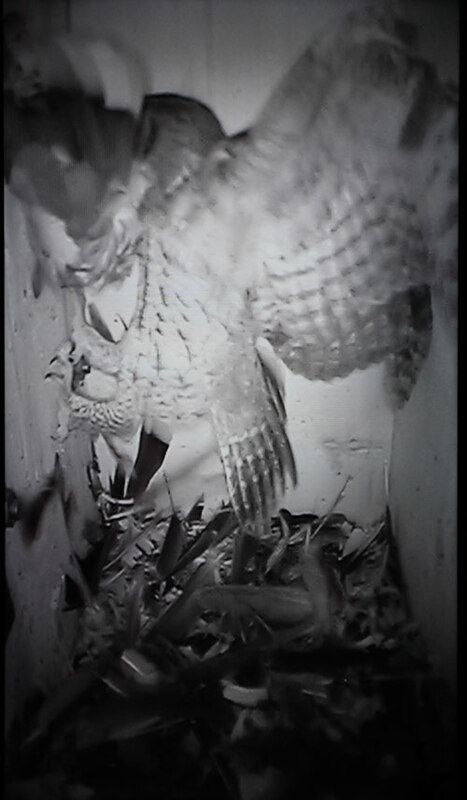 Yesterday morning there was a dove stuffed in the entrance of Tim’s owl box, hanging upside down, beheaded. 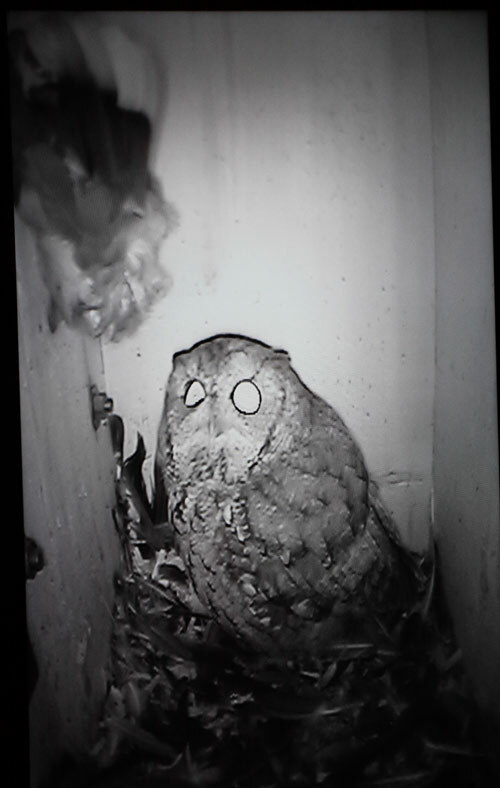 Inside the box, the owl stared up at it, not sure of what he done. Apparently, he caught the dove and carried it up to the box, but couldn’t fit the dove through the entrance into the box. How the owl managed to get in the box himself is still a mystery. The dove blocked the entrance so that the owl couldn’t get out either. He spread his wings and jumped toward the dove’s body, pulling at its feathers. It was evening, dark, and time to go out and hunt. 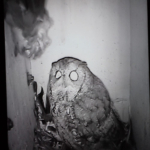 We watched the camera and the frustrated owl, trying to figure out how to help the screech owl without causing so much interference he would not return. Tim grabbed a long tree trimmer and we prepared to extricate the dove. As we stood in front of the box, maybe five feet away, Tim noticed a screech owl in the bird bath near the box. “She” was only about four or five feet away from us, waiting patiently for her mate. We stood still and silent, our eyes going back and forth from the little owl shape to the dove hanging lifeless from the box entrance. 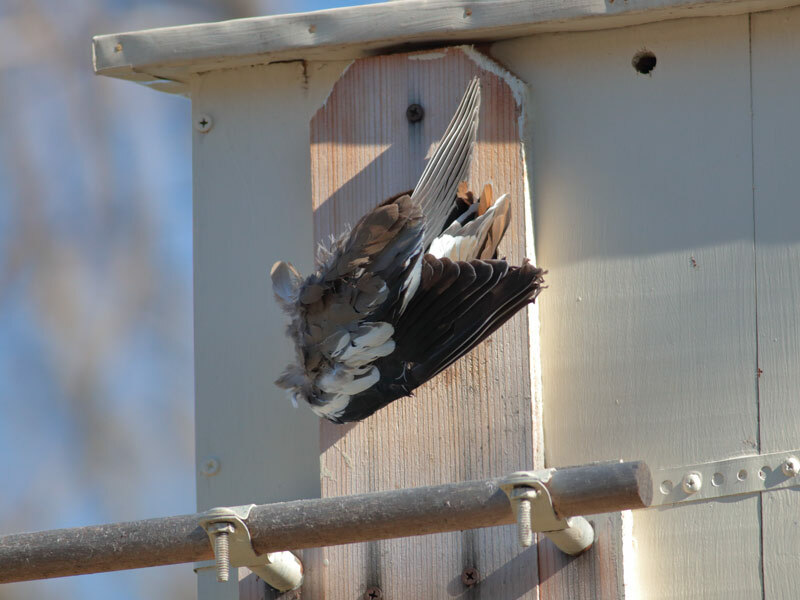 With one (okay – maybe two) brisk motions, Tim raised the trimmer and knocked the dove away from the entrance and the male screech owl shot out of the box. We hurried back into the house, relieved, and a little proud of ourselves. 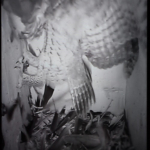 This morning the owl was back inside the box – with the dove.